We got this idea originally from a middle school in North Carolina -- she had a presentation about her Media Bonanza day at a NCSLMA conference several years ago. We have since adapted it to our library. This is our second year! 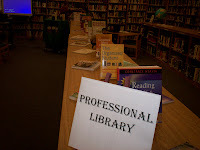 Library Media Bonanza is a day we close the library (except to check out books), and host a staff development opportunity for our faculty. 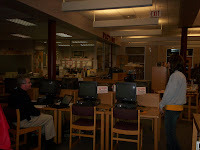 We talk our tech department into participating as well. This is a self-paced staff development where teachers can move from station to station at their own pace, and ask questions along the way. 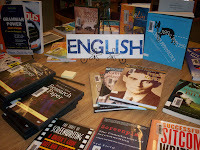 We also put out displays of new or notable books, DVDs, and Videos. 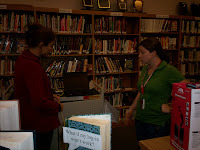 This year, our stations included Ethel on Finding Curriculum- related Podcasts, Lucy on how to operate the presentation carts and smartboard, a tech on mobile lab training and questions, our tech supervisor on Groupwise Mail and Calendars (and any other tech discussion). I am posting below some of the photos. 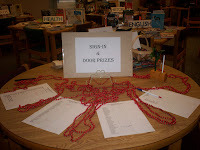 We tried to lure them in with hot spiced apple cider and door prizes. I would love to say it was wildly popular and attended by all, but it wasn't. Teachers could come in either during their planning bell, or after school. The 28 (out of a little over 100) members of our faculty who did attend seemed to learn something and enjoy it. Ethel and I are still puzzling over what it would take to get faculty to attend! We'd love to hear comments from others who do successfully offer staff development. Warning: our pictures are a little dark--our flash did not go off. We thought you may pick up ideas from even our displays and signage. Our easels all come from Dollar Tree. 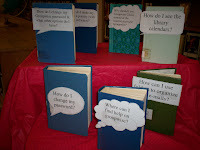 We also used discarded books with bubbles we printed that prompted teachers with questions we often get.